This may just be the coolest interactive Spanish﻿ site for reading that I have seen yet. 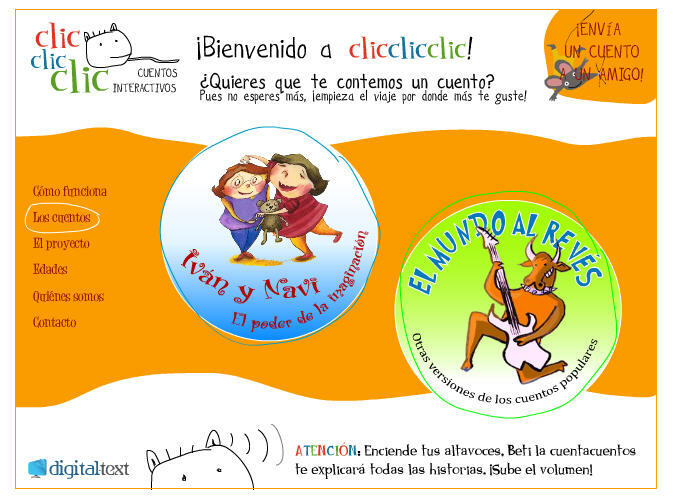 ClicClicClic is a project of Barcelona University, and features a number of interactive stories for children. The stories are divided into two categories: Iván y Navi, for children ages 3-6 who will need help from their parents; and El mundo al revés, for children ages 6-8. These digital stories are incredible! I don't know how they make things like this, but I can almost guarantee that both children and their parents will love these stories - and the site as a whole. Parents have the option of turning off the volume so that the kids can simply read the stories on their own, or leaving it on so that the children can enjoy story time. Such a clever and creative site! THANK YOU!!!!!!!!!! I love it!! I have been looking for something like this for a while. I agree, it's great!! IGUAL THANK YOU!!! I just sent the link to my immersion team. You're welcome! So glad to be able to share it with you.